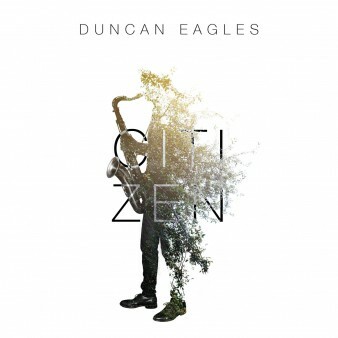 Saxophonist Duncan Eagles may be most familiar from his work with the trio Partikel; for this CD of compositions reflecting a more personal approach he’s put together an outstanding quintet to bring out a rather different sound. Melody is more to the fore than on his previous work, and the set even includes a couple hummable tunes which manage to work their way into one’s brain. He is helped by assembling an excellent supporting cast. With David Preston on guitar and Matt Robinson on piano, Eagles makes the most of the depth of texture that two chordal instruments allows. The two complement each other, Robinson adding a touch of contemplation to the quieter passages whilst Preston creates sounds which spread out like ripples over a pond. They are joined by Max Luthert on bass and drummer Dave Hamblett – both on fine form. Luthert plays some beautiful solos in the softer moments, and Hamblett drives and pushes the music without ever being overbearing. Eagles’ compositions seem upbeat and optimistic, perhaps against the grain of the times. Mostly mid-tempo, they are full of life. Riad, named for the houses Eagles saw in Marrakech, is a lively number featuring some ethereal guitar work by Preston. On Folk Song, the guitar is sometimes drone-like, making Eagles’ saxophone resemble bagpipes. The track also features an excellent solo by Robinson, exploring different avenues as he builds the intensity. Conquistador is perhaps the exception, a slightly mournful, slow piece featuring Eagles’ tenor over rumbling drums, bass and piano. The saxophone is breathy and moody, almost yearning. The CD closes with Midnight Mass, a slow, evocative piece in which Robinson’s gently contemplative piano leads the listener in until Eagles‘ sax opens up – a big, spacious, soulful sound. This is, of course, Eagles’ album. He’s collected together a series of compositions well suited to the rich tone of his tenor. His soprano playing is lighter, as if flying over the rooftops in Riad. He includes an epigram on the CD cover from pianist Randy Weston: “we all have music in us... and music is supposed to put you in tune with nature”. This bright, confident collection gives us an insight into Eagles’ nature. Duncan Eagles plays the Royal Festival Hall Foyer in London on 22 March and The Verdict in Brighton on 29 March.